As important as Apple’s iPad has been for Apple and its consumers, the iPad 2 has the potential to raise the stakes. Innovation is constant from Apple and many believe a more powerful processor, the addition of cameras and a slimmer body will make this device more useful and popular than ever. In the ETF world a variety of second generation ETFs have launched over the last few years that have refreshed and updated older ETFs in the marketplace. Three ETFs covering popular asset classes specifically stand out as they provide advances remarkably similar to those that Apple is delivering in the iPad 2. Here’s a chart to get this analysis started. More to come after the break. The world’s largest ETF Conference, Inside ETFs, was a successful event boasting close to 2,000 attendees. The new venue for the conference, the Westin Diplomat Resort and Spa in Hollywood, Florida was befitting this dynamic conference and industry. 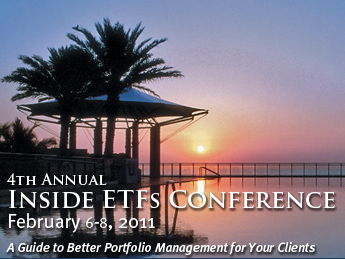 The Diplomat’s glass walls and view of the Atlantic Ocean exemplified the transparency and growth potential of ETFs. I trust this venue will be revisited next year.